With more stringent energy codes and an increasing trend toward sustainable design, architects are looking for every opportunity to improve the efficiencies of their buildings. The building frame offers a number of strategies for improvement, including the use of thicker wall framing such as with 2x6 studs and plates and insulated headers. In fact, the 2015 IECC Residential Energy Code sets minimum R-values for headers to be in compliance with table R402.4.1.1. Engineers are often overly conservative with header design, packing them with load-bearing capacity that’s far beyond what’s needed to meet load requirements. But in many cases, careful consideration of the load path allows for headers that meet structural requirements while providing wall cavity space for insulation. The need for more thoughtful design is simple: According to ASHRAE, 4 percent of the opaque wall is estimated to be made up of headers. In a 2x6 wall, a solid wood header has a total R-value of 6.88; a double 2x dimension lumber insulated header can have an R-value starting at 13.8. Depending on the type of insulation used to fill the cavity behind the header and the thickness of the structural wood header itself, that number can climb even higher. The key is to strike a balance between structural performance and energy savings. Calculate the loads and design the header to meet those loads and fill the remainder of the wall thickness with insulation. Headers are among the areas in which the engineer can maximize the airtightness and insulation in a structural frame. Most engineering firms have standard header tables that get reused from job to job; often the headers are sized to fill the cavity depth. But when design loads do not require full-wall-thickness headers, the amount of space occupied by structural wood members in the header can often be reduced to provide greater space for cavity insulation. In many cases, this can be accomplished through the use of engineered wood headers that can carry higher loads. Single-ply headers that use one lumber or engineered wood member to support loads over openings: The balance of the wall thickness can be filled with cavity insulation. For example: when a single 2x header (1-1/2-inch thick) is used in a 3-1/2-inch-thick wall, 2 inches of cavity insulation can be added to net a total header area R-value of 10 or greater. Double-ply headers with added insulation: While double-ply headers leave less room for insulation, there is still opportunity to increase the thermal performance. For example: when a double 2x header (3-inch thick) is used in a 3-1/2-inch wall, 1/2 inch of cavity insulation can be added. If 1/2-inch EPS rigid board insulation or polyisocyanurate is used to fill the open area, the insulation value of the header increases from R4.38 to R5.8 and R6.8, respectively. Even greater R-values can be realized in headers in 2x6 walls, due to the additional wall thickness. Wood structural panel box headers with insulation: Box headers incorporate the exterior wood sheathing and the framing to make a continuous box beam with space inside the header for cavity insulation. The insulation level of a box beam header can come close to the level of cavity insulation in the surrounding wall assembly. Section R602.7.2 of the 2012 IRC provides further details. 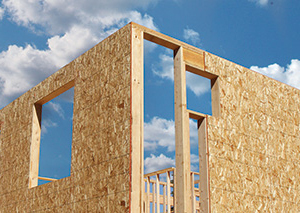 For additional details on insulated headers, download IECC Compliance for Wood Frame Wall Assemblies, Form 320, and the Advanced Framing Construction Guide, Form M400 from apawood.org.